US-headquartered compounder Teknor Apex will introduce a restructuring of its thermoplastic elastomer (TPE) brands that will enable it to serve as a single source of multiple compounds for European plastics processors in the automotive, medical, consumer products and wire and cable industries. All TPEs applicable to a particular end-use sector will now be grouped under a single brand, regardless of how widely the compounds differ in terms of polymer chemistry. Teknor Apex employs the industry’s broadest range of TPE chemistries and for the first time can produce compounds spanning the entire range of these chemistries at its plants in Belgium and the UK. 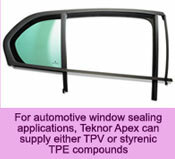 Included are many Teknor Apex TPEs developed in the US and previously unavailable in Europe. For example, the Sarlink brand once consisted exclusively of thermoplastic vulcanisate (TPV) compounds but has been expanded to include styrenic and olefinic blends, until now produced by Teknor Apex only in the US. Similarly, the company’s Elexar, Medalist and Monprene brands now include all TPE types designed for use in electrical/electronic, medical, and consumer-product applications, respectively.